Participants will learn to demonstrate IT’s commitment to the continual quality improvement of all the quality dimensions through clear reporting. IT managers with a focus on IT quality, team leaders, IT quality managers, CIOs. Individuals aiming to become Certified IT Quality Manager – CITQM. 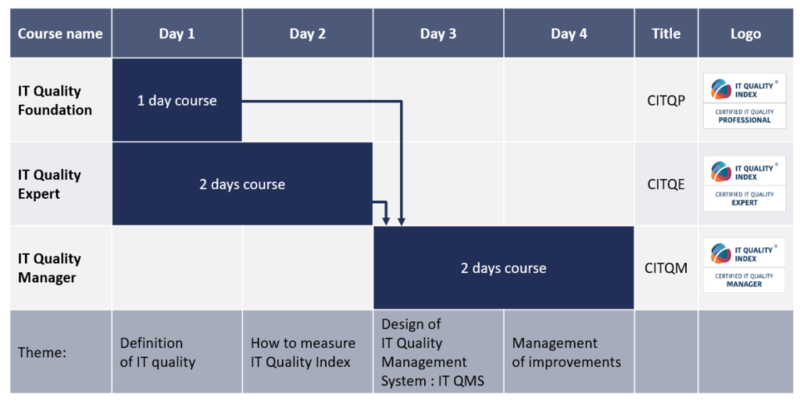 Course is targeted to IT quality managers managing continual IT quality improvement systems. This qualification presents deep understanding how IT Quality Index framework could form basis for continual quality improvement in all quality dimensions. Course participants will gain knowledge how to design, operate IT quality management system on strategic and tactical level. As a mandatory requirement candidates will need to have passed the IT Quality Index Foundation course and received a Certified IT Quality Professional certificate, or passed IT Quality Index Expert and received Certified IT Quality Expert. An understanding of the IT service management principles is necessary, so ITIL® Foundation or higher is recommended. The IT Quality Index book or courseware from the IT Quality Index Foundation is required for the exercises within the course and the final exam. There is no prereading associated with the IT Quality Manager training session. Certification exam - 45 minutes. Quality management QUMG 5-7, Quality assurance QUAS 5-6, Measurement MEAS 5-6, Conformance review CORE 5-6. Showing 1 to 5 of 9 Total Course Dates.